Born and bred in Appleton, WI Dave is Proud to be one of the original members of Boogie & the Yo-Yo’z. 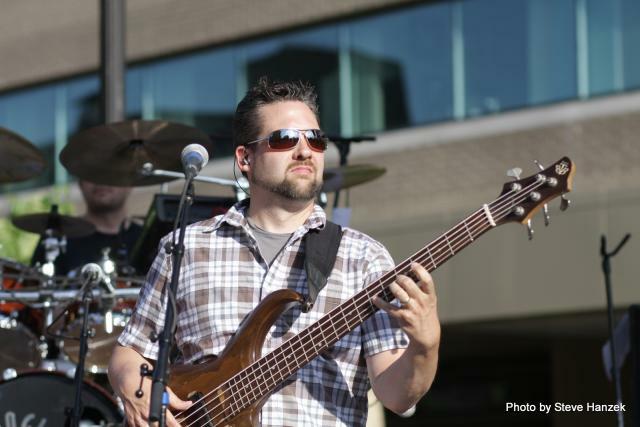 Since picking up the bass when he was 17 Dave has enjoyed a variety of playing experiences including subbing in for the Neenah Jazz Ambassadors, hosting open jams and pit work for local musicals including Evita, My Fair Lady, Guys and Dolls, West Side Story, Jesus Christ Superstar and more. He also played in college while pursuing a Music Education Degree at UW Fox Valley and at UW Stevens Point. While at UW Fox, Dave played in the Concert Band and Jazz Band. At UWSP Dave performed with the Orchestra and the Jazz Lab Band. While at UWSP Dave also was a member of Phi Mu Alpha Sinfonia with which he held the positions of Vice President and President. Dave Eventually graduated from UWSP with a B.S. in Arts Management and a minor in Music. Dave’s ‘day job’ is with the Grand Opera House in Oshkosh where he is their Event Manager and he currently lives in Appleton with his wonderful wife, Becca, and his darling little girl, Emily. In the little spare time he has Dave enjoys being with family, watching live music, grilling and traveling.